(A) The skull of Johann Sebastian Bach; (B) Haussman’s 1746 oil painting of Bach (C) the bust Seffner modelled on a cast; (D) the bust, in profile, with left half removed to show the relations of the soft parts to the bone. Image credit: Meisenbach, Riffarth & Co. from Wilhelm His, Johann Sebastian Bach, Leipzig, 1895. Outside of St. Thomas’s Church in Leipzig, Germany stands an eight-foot tall bronze statue of Johann Sebastian Bach, the legendary 17th century composer, which was built to honor the man who is entombed inside. The monument is the result of a collaboration between an anatomist and an artist, who teamed up to craft the first facial reconstruction. Facial reconstruction is a tool used by law enforcement to help identify a body or a technique used by researchers to reproduce the face of a famous historical figure (Byers 2008). The techniques of facial reconstruction have evolved over the years with technology. Forensic artists used to use clay to build up tissue on a reproduction of the skull. Today, artists use laser scans and computer modeling to add facial features. The first time facial reconstruction was used was on the skull of Johann Sebastian Bach. Bach (1685-1750) was a German composer of the Baroque period whose famous works include “The Well-Tempered Clavier“, the “Brandenburg Concertos,” and “Mass in B Minor.” When Bach died in 1750 his body was put in an oak coffin, one of only twelve oak coffins interred that year at the Old St. John’s Church in Leipzig. But because he was buried in an unmarked grave the exact location of Bach’s grave was lost over the years (Zegers, Maas, Koopman, & Maat 2009). In the late 19th century there was a lot of interest in Leipzig to find Bach’s burial place. So when St. John’s Church was due for a renovation in 1894, church officials seized the opportunity to look for Bach’s remains. According to oral tradition Bach was buried “six paces from the south door of the church (Stauffer 2000).” On October 22, 1894, when the “excavators” broke ground on a plot in that location the diggers found an oak coffin. “ A team of anatomists and physicians led by Wilhelm His, Sr. the professor of anatomy and physiology at the University of Leipzig, examined the bones to verify they belonged to Bach (Stauffer 2000). His believed that the bones belonged to a man who was about 65 years old, which was Bach’s age at the time of this death (Zegers, Maas, Koopman, & Maat 2009). Unfortunately this exam loses a wee bit of credibility because of His’ reliance on phrenology. His found a bump on the petrous part of the temporal bone near the ear, which he felt indicated musical talent. Based on the location of the grave, the age of the body at death, and the phrenological feature His asserted the bones belonged to Bach (Zegers, Maas, Koopman, & Maat 2009). But there was still some question as to what Bach looked like. Although there are many images of the composer, he is only known to have sat for one painting for the artist Elias Gottlob Haussman in 1746, when he was 61. All subsequent paintings and engravings used this picture as a model (Stauffer 2000). So Wilhelm His wanted to use Bach’s skull to reconstruct his fact to test the accuracy of these earlier images. This was a big deal at the time because it was the first facial reconstruction. As an anatomist His understood that he needed to know tissue thickness of different parts of the face so he obtained 37 cadavers (24 male suicides, 4 female suicides, and 9 males who died from a “wasting disease”). He devised a way to take soft tissue measurements by using a needle. His set a small rubber disk at one end of a sewing needle and a handle at the other end. Then he chose 15 specific locations on the face and pushed the needle into the face until the needle touched the bone, which moved the rubber disk up the needle. When His pulled the needle out he measured the distance from the tip to the rubber disk in millimeters and averaged out the tissue thickness measurements (Wilder 1912). Wilhelm His hired Carl Seffner, an artist he knew from anatomy class, to do the facial reconstruction. Seffner built up clay on a cast of Bach’s skull according to the tissue thicknesses from His’ cadaver data collection. Seffner then used the painting by Haussman as a guide to help him with the features that tissue thickness could not. The resulting clay model looked like the contemporary paintings and engravings of Bach (“Tour of our permanent exhibition” 2014). This facial approximation confirmed the identity of the skeletal remains for His and Seffner. Using this likeness Seffner sculpted a marble bust that sits in the Bachhaus Museum, and the bronze statue out in front of St. Thomas Church (Stauffer 2000). 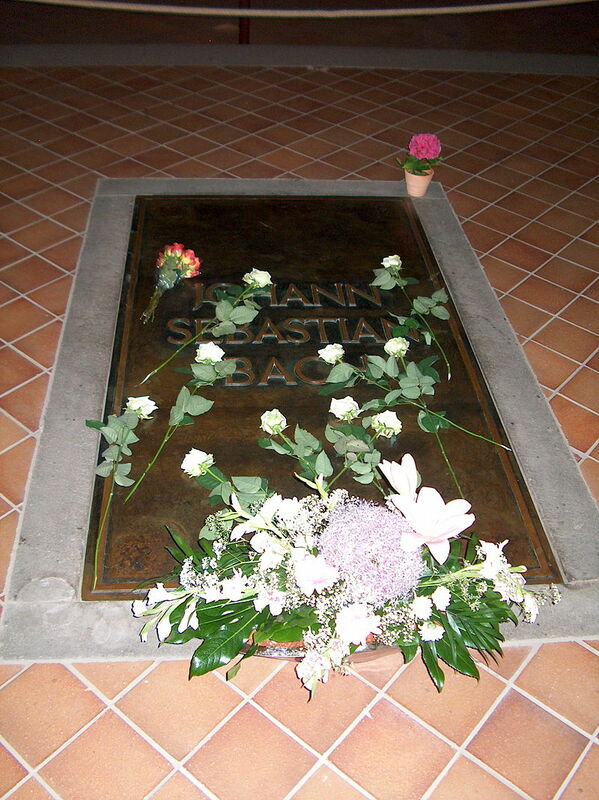 Bach’s grave, St. Thomas Church, Leipzig. Image credit: Furfur via Wikipedia. The remains of Johann Sebastian Bach were reburied in a vault in St. John’s Church. Because Allied bombing destroyed the church during WWII, Bach’s grave was moved to its present location at St. Thomas Church in 1950. In 2008 the Bachhaus Museum reached out to Centre of Forensic and Medical Art at the University of Dundee to do a modern forensic facial reconstruction because there were some obvious questions about the accuracy of the 1894 approximation. The museum loaned Dr. Caroline Wilkinson and her team a bronze cast that Seffner made of Bach’s skull. The skull was subjected to laser scans and the data was imported into the centre’s computer system. Wilkinson digitally reconstructed Bach’s musculature and skin using their muscle database, and used paintings and written records to help with facial details caused by chronic health problems. The resulting 3D reconstruction went on display at the Bachhaus Museum in Eisenbach, Germany (Abadi 2008, “Building the face of Bach” 2008, Connolly 2008). Research by Richard Zegers, Mario Maas, A .G. Koopman, and George Maat (2009) questions the validity of the His/Seffner reproduction because of the questionable physical exam, the problematic methods used to locate Bach’s grave, and the reliance on the 1746 painting to approximate his face (Zegers, Maas, Koopman, & Maat 2009). Only a DNA test with Bach’s descendants can confirm or disprove His’ findings. But for me the data collection of facial tissue thickness and the pioneering first facial reconstruction are the most important parts of this story, not whether or not the bones in the grave at St. Thomas’ Church belong to Johann Sebastian Bach. Byers, S. (2008). Introduction to forensic anthropology. Boston, MA: Pearson Education, Inc.
Wilder, HH (1912). The physiognomy of the Indians of Southern New England. American Anthropologist, 14, 415-436. Zegers, R.; Maas, M.; Koopman, A.G.; Maat, G. (2009). Are the alleged remains of Johann Sebastian Bach authentic? The Medical Journal of Australia, 190, 213-216. Reblogged this on A.F. Moisés Villa.